Using the unique capabilities of telescopes specialised on cosmic gamma rays, scientists have measured the smallest apparent size of a star on the night sky to date. The measurements with the Very Energetic Radiation Imaging Telescope Array System (VERITAS) reveal the diameters of a giant star 2674 light-years away and of a sun-like star at a distance of 700 light-years. The study establishes a new method for astronomers to determine the size of stars, as the international team led by Tarek Hassan from DESY and Michael Daniel from the Smithsonian Astrophysical Observatory (SAO) reports in the journal Nature Astronomy. Almost any star in the sky is too far away to be resolved by even the best optical telescopes. To overcome this limitation, the scientists used an optical phenomenon called diffraction to measure the star’s diameter. 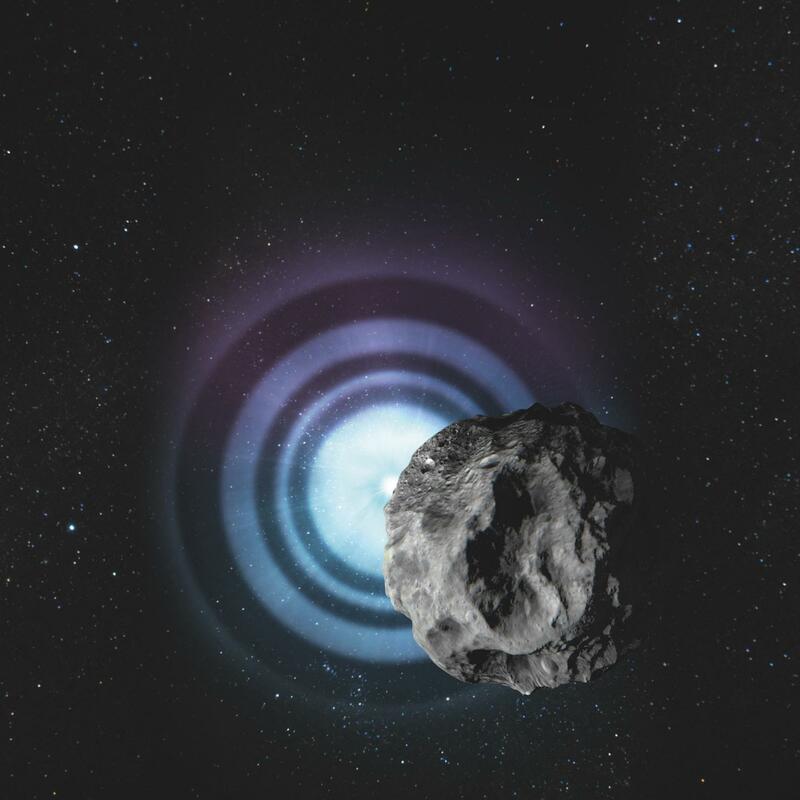 This effect illustrates the wave nature of light, and occurs when an object, such as an asteroid, passes in front of a star. “The incredibly faint shadows of asteroids pass over us everyday,” explained Hassan. “But the rim of their shadow isn’t perfectly sharp. Instead, wrinkles of light surround the central shadow, like water ripples.” This is a general optical phenomenon called a diffraction pattern and can be reproduced in any school lab with a laser hitting a sharp edge. The researchers used the fact that the shape of the pattern can reveal the angular size of the light source. However, different from the school lab, the diffraction pattern of a star occulted by an asteroid is very hard to measure. “These asteroid occultations are hard to predict,” said Daniel. “And the only chance to catch the diffraction pattern is to make very fast snapshots when the shadow sweeps across the telescope.” Astronomers have measured the angular size of stars this way that were occulted by the moon. This method works right down to angular diameters of about one milliarcsecond, which is about the apparent size of a two-cent coin atop the Eiffel Tower in Paris as seen from New York. However, not many stars in the sky are that “big”. To resolve even smaller angular diameters, the team employed Cherenkov telescopes. These instruments normally watch out for the extremely short and faint bluish glow that high-energy particles and gamma rays from the cosmos produce when they encounter and race through Earth’s atmosphere. Cherenkov telescopes do not produce the best optical images. But thanks to their huge mirror surface, usually segmented in hexagons like a fly’s eye, they are extremely sensitive to fast variations of light, including starlight. Using the four large VERITAS telescopes at the Fred Lawrence Whipple Observatory in Arizona, the team could clearly detect the diffraction pattern of the star TYC 5517-227-1 sweep past as it was occulted by the 60-kilometre asteroid Imprinetta on 22 February 2018. The VERITAS telescopes allowed to take 300 snapshots every second. From these data, the brightness profile of the diffraction pattern could be reconstructed with high accuracy, resulting in an angular, or apparent, diameter of the star of 0.125 milliarcseconds. Together with its distance of 2674 light-years, this means the star’s true diameter is eleven times that of our sun. Interestingly, this result categorises the star whose class was ambiguous before as a red giant star. The researchers repeated the feat three months later on 22 May 2018, when asteroid Penelope with a diameter of 88 kilometres occulted the star TYC 278-748-1. The measurements resulted in an angular size of 0.094 milliarcseconds and a true diameter of 2.17 times that of our sun. This time the team could compare the diameter to an earlier estimate based on other characteristics of the star that had placed its diameter at 2.173 times the solar diameter – an excellent match, although the earlier estimate was not based on a direct measurement. “This is the smallest angular size of a star ever measured directly,” Daniel emphasised. “Profiling asteroid occultations of stars with Cherenkov telescopes delivers a ten times better resolution than the standard lunar occultation method. Also, it is at least twice as sharp as available interferometric size measurements.” The uncertainty of these measurements are about ten per cent, as the authors write. “We expect this can be notably improved by optimising the set-up, for example narrowing the wavelength of the colours recorded,” said Daniel. Since different wavelengths are diffracted differently, the pattern is smeared out if too many colours are recorded at the same time. The Harvard-Smithsonian Center for Astrophysics, the University of California at Los Angeles and at Santa Cruz, the Columbia University in New York, the University of Potsdam, the Iowa State University, the Purdue University, the University of Minnesota, the California State University, the National University of Ireland at Galway, the McGill University in Montreal, the University of Delaware, the University of Iowa, the University of Utah, the DePauw University in Greencastle, the University College Dublin, the University of Wisconsin-Madison, the Cork Institute of Technology, the University of Alabama, the University of Chicago, the Universidad Complutense de Madrid, the University of Durham and DESY contributed to this research. DESY is one of the world’s leading particle accelerator centres. Researchers use the large?scale facilities at DESY to explore the microcosm in all its variety – ranging from the interaction of tiny elementary particles to the behaviour of innovative nanomaterials and the vital processes that take place between biomolecules to the great mysteries of the universe. The accelerators and detectors that DESY develops and builds at its locations in Hamburg and Zeuthen are unique research tools. DESY is a member of the Helmholtz Association, and receives its funding from the German Federal Ministry of Education and Research (BMBF) (90 per cent) and the German federal states of Hamburg and Brandenburg (10 per cent).